A man is standing next to a slot machine with his hand on its lever. A woman stands nearby. Man: Darn it! I keep losing. These slot machines must be rigged. Woman: Impossible. 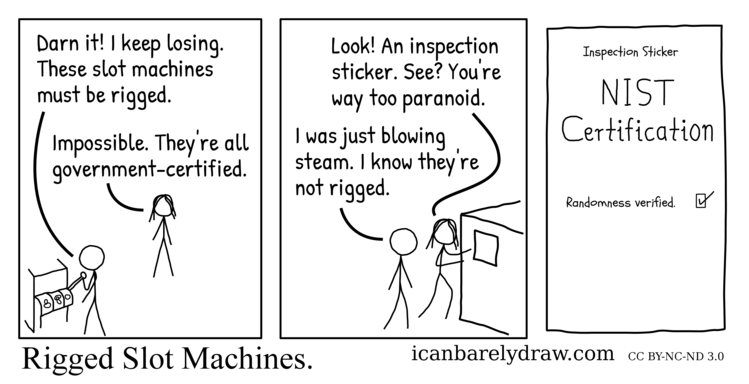 They're all government-certified. The next panel shows the woman leaning towards and pointing towards a rectangular document stuck to what might be the back of the slot machine. The man stands nearby. Woman: Look! An inspection sticker. See? You're way too paranoid. Man: I was just blowing steam. I know they're not rigged. The third and final panel shows a rectangular document on which can be seen the centered words: Inspection Sticker. Below these words, in larger type, are seen the centered words: NIST Certification. Below these are seen the words: Randomness verified. Next to the above words, and to the right, is a check-box that has been filled in with a check mark.